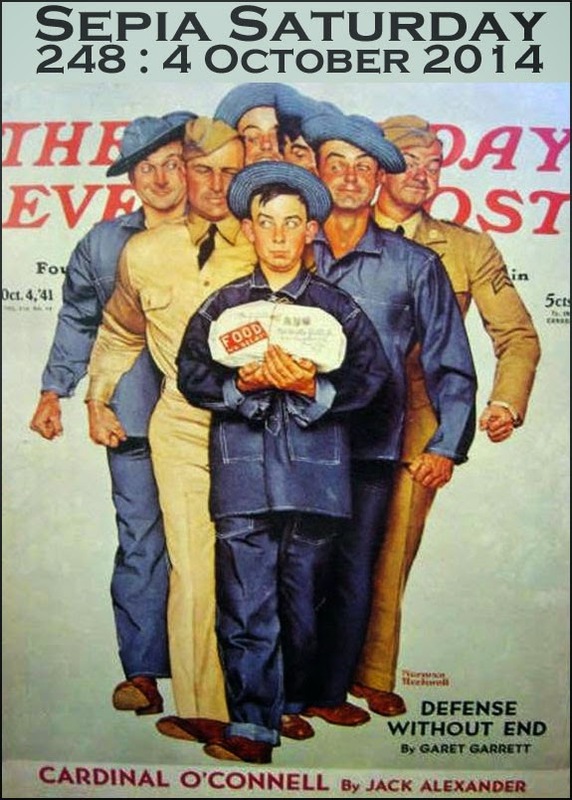 The 4th October is the date in 1941 that Norman Rockwell launched a series of Saturday Evening Post covers depicting Willie Gillis. Rockwell described Gillis as “an inoffensive ordinary little guy thrown into the chaos of war”. Willie made his debut carrying a food parcel and suddenly everyone wanted to be his friend. No chaos here this week; Alan is on holiday and I’m reasonably organised. All you have to do is choose a theme suggested by the prompt picture: the little guy, parcel from home, food package, followers, magazine covers or whatever else you see. 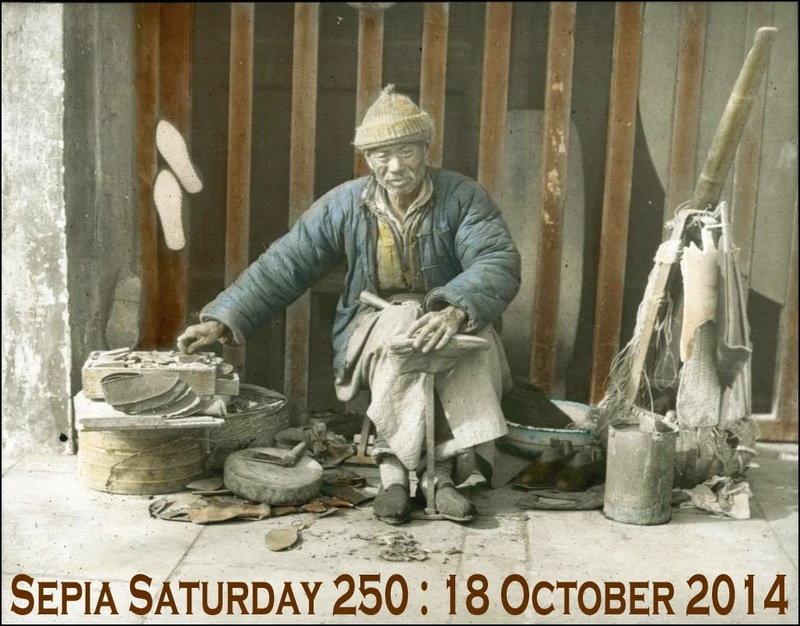 Post your own old images, sometime around Saturday 4th October, with a link back to Sepia Saturday. Enter your (direct) link to your own blogpost below and leave us a comment please.Then off you go to follow other Sepians and see what goodies they have unwrapped in their packages, remembering to leave a thank you note for sharing. Enjoy! 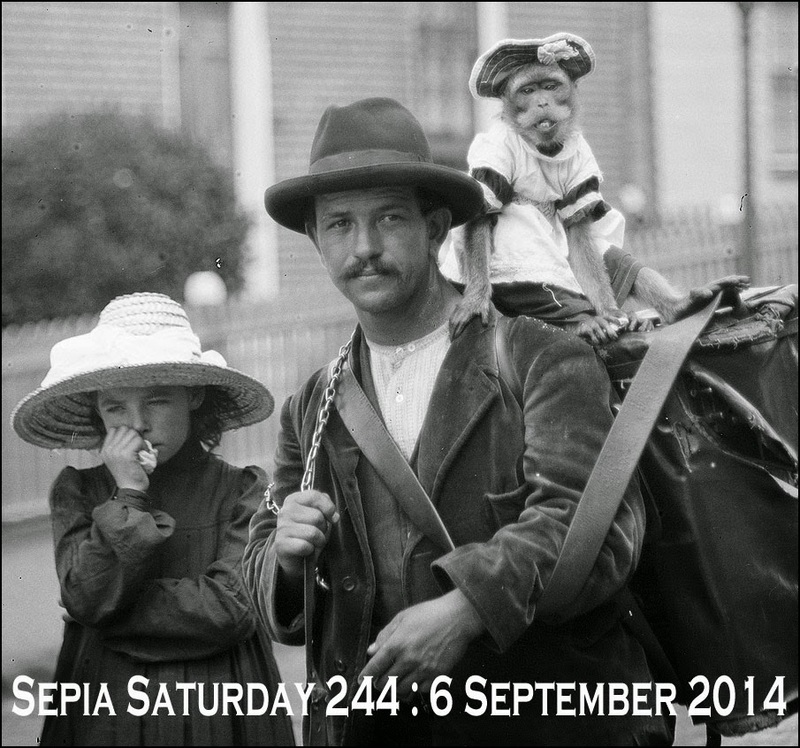 Before I go, I’ll just mention that there is a Facebook group for Sepia Saturday contributors. Why not join us as we have a lot of fun and post some interesting items there. You will need to have posted on Sepia Saturday at least once; then we’ll welcome you with open arms. To whet your appetite for future posts here is a taster of what’s on the sepia menu over the next couple of weeks. And here’s the little version of the little guy to add to your post if you wish. Times might have been hard but it is now time to get on your bike and take to the road. Time to leave the safety of the tent behind on see what awaits you over the next hill or around the next bend. 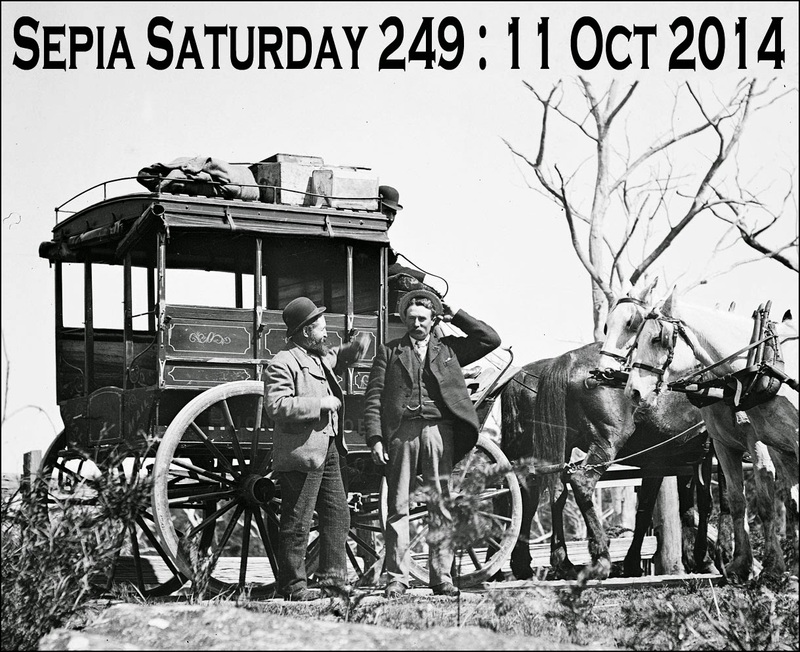 It is time to put your post together for Sepia Saturday 247. All you have to do is to post an old image and say something new about it. 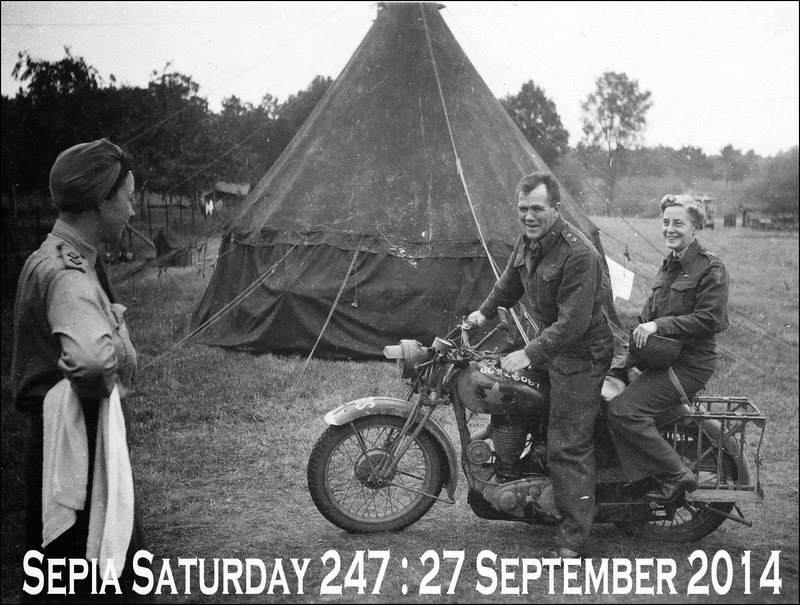 If you would like to follow the theme, you can link to tents, towels, turbans, motorbikes, uniforms or any other visual prompt you can find in this 1944 photograph from the Provincial Archives of Alberta which is entitled "Canadian Motorcycle Courier and Two Servicewomen". Once you have posted your post you can link it to the list below and rev-up your digital bikes and visit all your sepia friends. Before you throttle up the engine, take a look at what awaits you around the sepia corner. And now I am going to follow my own advice, although my transport of choice will be a rather large cruise ship rather than a motorbike. My good friend and fellow Sepia Saturday administrator, Marilyn Brindley, will be looking after the calls whilst I am away. I will be back, fully refreshed and hopefully ready to start blogging again, in time to take part in SS250. See you then. Things are slowly but steadily improving here in Sepia Towers and a couple more weeks and a little time in the sun might see me back in circulation. When we do venture into the recuperative sun I doubt whether we will be staying under canvas, but I hope we are as happy as this trio of happy campers. 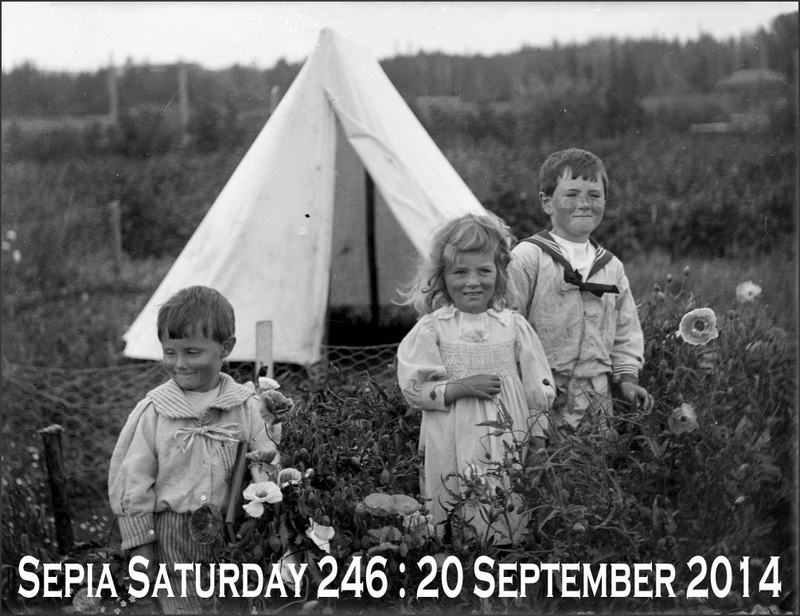 For the themers in the sepia tent, there are lots of possibilities - children, tents, fences, fields, poppies, smocks, or even sailor-suits again. And, as always, you can pitch your tent in the non-theming section of the campsite and go with any old photograph you like. Just post your post on or around the 20th September 2014 and link it to the list below. Before you hammer those Sepia tent poles into the ground take a look at what is to come during the next couple of weeks. So there we go. It's time to open the picnic basket in the great Sepia Tent of Memories. It's time for Sepia Saturday 246. Three men. One bottle of whiskey. A friendly argument. A woman watching from the sidelines. 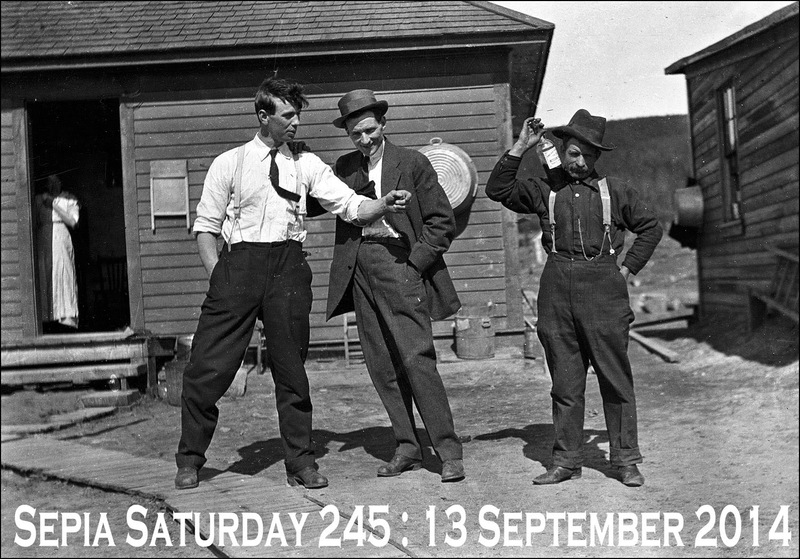 The photograph was taken in Alberta back in 1916. 100 years later, the discussions still go on and all too often - at our house at least - a decent bottle of single malt will help the participants underline a point or emphasise an argument. The difference is, I am pleased to say, that women no longer hide in the background. There are a bottle full of potential themes for Sepia Saturday participants - drinking, sharing, posing and lurking have been suggested. Whatever you decide, just post your post on or around Saturday 13th September 2014 and link your post to the list below. Before you pour yourself a glass of nostalgia, take a look forward at the next couple of Sepia themes. Things have been a bit complicated for the last couple of weeks (I will put a post up on my blog to explain) so I am going in search of a glass of malt. Cheers. So, there we go. Give the monkey any spare coins you may have and I'll turn the handle and start the music off. It's that familiar Sepia Saturday tune again.